A simple, delicious and perfect lunch or dinner dish, Chicken Lo Mein is a classic Chinese noodles dish made with chicken, egg noodles and vegetables. 1. Cook the noodles as per packet instructions. Drain well, rinse under cold water and drain again. Keep aside until required. 2. Mix the vinegar, 1 tblsp soy sauce and half of the sugar in a large bowl. 3. Add the chicken pieces and toss well to coat. 4. Keep aside for 15 to 20 minutes. 5. Mix the chicken stock, remaining soy sauce, sugar and corn flour mixture in a bowl. 6. Heat oil and sesame oil in a pan. 7. Saute the garlic for 20 to 30 seconds. 8. Add carrot and cook for a minute. 9. Add the spring onions and cabbage. 10. Stir-fry for a minute or two and remove the vegetables from the pan. 11. Drain the chicken and discard the marinade. 12. Add the chicken to the pan and cook for 2 to 5 minutes or until no longer pink. 13. Remove the chicken from the pan. 14. Add the sauce and stir well until thickened. 15. Add the noodles, vegetables, chicken and mix well until combined. 16. Remove and transfer to a serving dish. 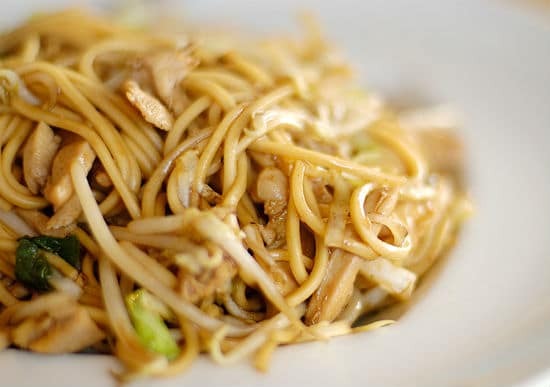 Feel free to comment or share your thoughts on this Chicken Lo Mein Recipe from Awesome Cuisine.